The Cadillac community came together Friday and Saturday to help their neighbors in need. It was the 3rd annual Grab ‘n Go donation event at Kenwood Elementary School. People in the community dropped off clothing donations on Friday. Saturday morning, they opened the doors for anyone to come in and grab what they need as spring weather approaches. 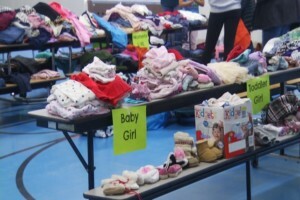 Donations came in all sizes and styles. Teachers who organized the event say it’s important for the kids to see this example of giving. “It’s really heartwarming, and I think the very best thing is now that we’ve done it so many times, we see people coming to donate that usually are also here to take stuff, so we’re really seeing people give back and take which is really nice,” said Samantha Garner, who organized Grab ‘n Go. The school holds the Grab ‘n Go event two times a year. You can give or take each spring and each fall.